Industry participation is key for the research work of IEA’s Solar Heating and Cooling Programme. Hence, the researchers of Task 49, Solar Heat Integration in Industrial Processes, used the last meeting in France in mid-September to hold a one-day workshop dedicated to Solar Heat Integration in Industrial Processes (SHIP) in cooperation with French start-up Energy Service Company Sunti. In Montpellier, SHIP 2015 gathered experts from the solar process heat collector industry, researchers, government and non-government organisations, as well as representatives for potential customers. Customers were particularly interested in the economic feasibility of systems. A wide variety of plants and operation data was presented. The photo shows the installation of the world’s largest solar process heat plant at the Gaby copper mine in Chile. Each year, the plant saves 6,500 tonnes of diesel, which would have had to be transported by 250 trucks through the desert. SHIP 2015 brought together almost 70 participants from 16 countries, among them stakeholders from the entire value chain, be they solar technology providers or heat consumers, and also analysts, consultants specialised in industries and factory builders. Whilst there was great participation from solar industry professionals, it still proved difficult to reach out to the customers from the heat-consuming industry. Among the participants from heat consumers were a delegate representing the Chinese metal industry, a factory builder, a pharmaceutical company and a representative for the Chinese copper association. “The key is to get the industry associations involved. Here, we did not have a strong local industry association participating in the event,” says Christoph Brunner, Operating Agent of IEA SHC Task 49 and Head of the Department of Industrial Processes and Energy Systems at Austrian institute AEE INTEC. Their key interest in solar thermal process heat was mostly economic. “Typically, the questions revolved around general economic feasibility, incentive schemes and financing,” Brunner says. SHIP 2015 took place in Montpellier one day before the 8th meeting of the joint task between Solar Heat Integration in Industrial Processes of Task 49 and SolarPaces IV. During the two events, many companies from the solar process heat industry presented a large variety of plants, including the low- and medium-temperature applications for the manufacturing sector of which some have already been described in news articles on solarthermalworld.org, such as a textile factory in China, poultry processing factory in USA, dairy processor in France, cheese production in Italy, garment industry in India and a pharmaceuticals producer in Jordan. But the presentations also highlighted some new technological approaches. The largest project is scheduled to start construction in late 2015 and was shown at SHIP 2015 during the presentation by Cédric Philibert from the IEA: Californian company GlassPoint will begin setting up a plant called Mirrah (which means mirror in Arabic) in southern Oman, with a total collector area of 3 million m² and a targeted heat power of more than 1 GW. 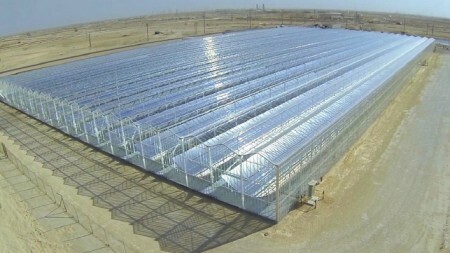 Parabolic trough collectors, protected by glasshouses from the harsh desert environment, are said to generate steam for enhanced oil recovery. Tobias Prosinecki from the German Aerospace Centre, DLR, presented a new approach towards high-temperature systems of up to 1,000 °C. The overall plant design is a CSP tower plant. Multiple heliostats focus the sunlight on the receiver located at the top of a tower. The innovation is the so-called centrifugal particle receiver. It consists of an insulated steel drum, open at the front side, at which the concentrated sunlight enters into the receiver. Inside the receiver, solid bauxite particles serve as absorber material. Due to the centrifugal force, the particles attach to the inner wall of the receiver, slowly moving downwards to the open side while heating up. Finally, at the bottom of the receiver, they exit into a collector ring and are fed into a transportation system. By varying the rotational speed of the drum, exposure time of the particles to sunlight can be controlled – and with it, the temperature of the particles can be kept stable, even with solar irradiation fluctuating. As the system works at a concentration factor of higher than 2,500, the surface of the receiver is very small in relation to the collected energy, which leads to very few thermal losses. The receiver can reach an efficiency in excess of 90 % at 1,000 °C. Regarding the entire system, about 50 % of the solar energy could be converted into usable heat at a temperature of 1,000 °C, according to simulations. The particles do not only serve as receiver material, but also as storage. They can even be transported in a truck over short distances, as has already been done in the aluminium industry. A prototype of the receiver was built at DLR in Stuttgart, Germany, and tested successfully in the DLR solar simulator in Cologne with up to 900 °C of particle outlet temperature. Tests at the DLR solar tower in Jülich, Germany, are planned for 2016, whereas commercial demonstrations are said to take place in 2017. An economic evaluation assuming no loans or subsidies and based on the example of a foundry in Sao Paolo shows that using this solar process to preheat the scrap to 600 °C might pay off within four years. The current task will end in December 2015. The last task meeting will be held at the SHC conference in Istanbul in December. It will also be the time to present the final deliverables of the task, such as a solar process heat collector database, results of collector testing and a handbook on the integration of solar process heat.